I’ve been digging through the Criterion collection stuff since singing up for Hulu Plus, an activity that’s maddening in its density (and will probably warrant its own post eventually) but it has been fascinating just in the variety of movies I’ve come across. Today I want to talk a bit about Hotel Monterey. 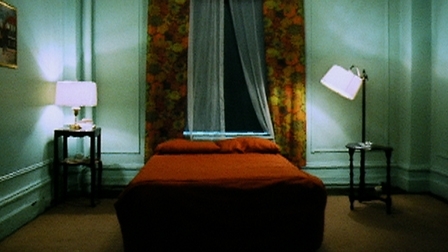 Hotel Monterey is a 62 minute ‘documentary’ by Belgian director Chantal Akerman. I quote documentary because there isn’t really a narrative to Hotel Monterey. For one, it’s silent, bereft of music or words or anything outside of its images. And secondly, it’s not actually a movie about anything in the strictest sense of the definition of plot. Hotel Monterey starts with a static camera in the lobby of a run down New York hotel. People drift in and out of frame, more silhouette than real. The hotel looks run down, poorly lit and filmed in a way that make the colors look more like stains than genuine tones. And then the camera begins roaming around the hotel, usually in long static shots. 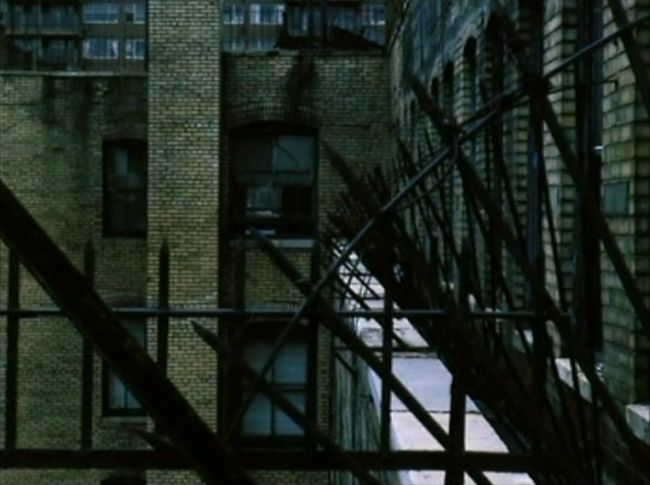 The film is more an exploration of space than anything concrete, but it’s interesting how much emotion Akerman can get by just letting her camera sit and observe. The Hotel Monterey is nothing to write home about, with tiny rooms with garish colors and long hallways that stretch endlessly down poorly lit paths like timeless catacombs. The movie, filmed over a single night, is nearly deserted. Most of the people we see are when the camera is stuck in an elevator, drifting up and down floors that all look alike. If it wasn’t for the motion of the lights on the single window of the elevator, we’d never know we moved. When people approach the door and see the camera, the most common reaction is to recoil and not get on. It seems to be appropriate to the entire film. As the movie winds on we drift up the hotel, through rooms where people sit unmoving and in hallways where doors open as distant slices of light and the shuffling motion of unknowable shadows. We see little. We know less. Anybody who has spent a long night in some undesirable place will understand the feeling of reality slipping away that these images seem to capture. It feels at turns creepy and playful, a rundown riff on Edward Hopper paintings constructed as cinematic tableaux, using time to make the space have a weight to it, whether that weight is a comforting blanket or a crushing sense of dread is up to the viewer. Eventually we reach what appears to be the top floor. The camera slowly drifts towards the window, looking out at a blackness that feels like its the end of the world. 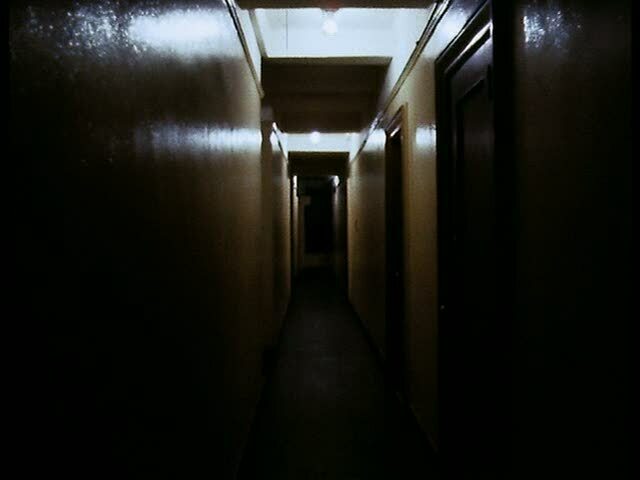 The camera retreats back down the hall. It is unwilling to go any further, and I can’t say I blame it. A cut, and suddenly the window is spilling out light. Morning has come. We haven’t moved. Fitful sleep, perhaps, when exhaustion leads to a blink that lasts dreamless hours, confusion about what time has passed and how. The camera approaches the window, the light so bright that it blows out the entire scene. The camera backs away, and approaches again, seemingly adjusted (as we are) to the light. We look outside. Its early morning New York, sleepy and immobile, almost alien after all our time spent in cramped hallways and tired sagging rooms. The camera retreats to the roof. Here it is iron bars and run down brick walls, looking like a fortress among the sea of buildings. The Hotel Monterey is ugly but there’s a certain fondness for it now, climbing up it from the inside out. As the camera pans along the New York skyline and we see hundreds of other buildings, the hotel seems far more welcoming. At least we know it. It is us. All the rest out there, those Other buildings, are unknowable and thus the cause for concern. The bigness of the city is dizzying. The camera begins to tilt up towards the early morning sky and blue fills the frame. It is so uniform, so clear, that it becomes impossible to tell if the camera is moving at all. At a big enough scale, movement and static images become one in the same. It’s all a matter of scale and perspective. And when we finally come back down to the city, our perceptions reset by the blank infinity of the sky, the city seems welcoming. Normal. Just New York in the 70s in the morning. Nothing to worry about it. Being non-narrative and silent and deliberately slow, Hotel Monterey isn’t for everyone. It’s not a movie by most people’s definition, sliding more firmly into the space of ‘modern art’ which is much easier to dismiss and much harder to define. I don’t see why it can’t be both, but I simply appreciated it for what it was and what it made me feel. I hope maybe I shared some of that here, even if the film itself is of no interest to you. This entry was posted in criterion cuts, splices. Bookmark the permalink.